US real estate mogul and billionaire Donald Trump slammed the Obama administration over its Trans-Pacific Partnership (TPP) trade deal, labeling it as disastrous and warning that it will encourage US companies to slash domestic jobs. “The new trade deal is a disaster,” The Hill quoted Trump as saying at the South Carolina Freedom Summit in Greenville, South Carolina. Trump stressed that the deal would encourage US companies to move their production abroad, weakening US domestic job market. 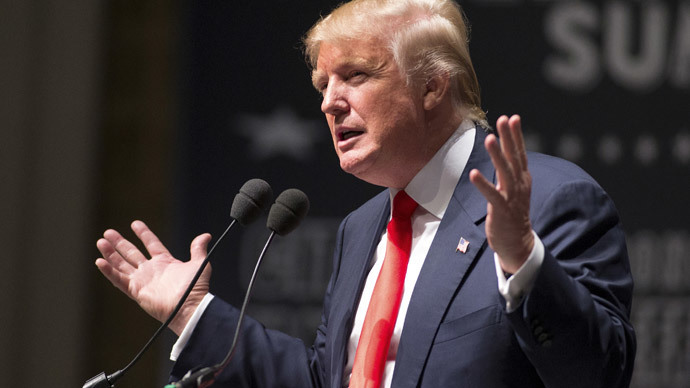 Trump is one of the potential Republican presidential candidates for the 2016 elections. The proposed TPP free trade agreement includes 12 countries, with the US at the helm. The other countries are Australia, Brunei, Canada, Chile, Japan, Malaysia, Mexico, New Zealand, Singapore, Vietnam, and Peru. If approved, the deal will encompass nations representing more than 40 percent of the world’s gross domestic product. However, the agreement has been heavily criticized, including for the lack of transparency during negotiations. Most of the known draft documents have been revealed by the anti-secrecy group WikiLeaks, which is trying to disclose as much of the agreement as possible before it is adopted. One of the recently leaked chapters from the TPP reveals that firms would allegedly be allowed to sue the countries they are operating in via private courts, steering clear of national jurisdictions. Supporters of the TPP argue that the deal will open up new markets for American products, but critics have raised issues, including currency manipulation, environmental protections and internet privacy. A common argument against the treaty is that American people will not be the beneficiaries of this agreement since domestic jobs are likely to be cut.